Want some advice? Start paying close attention to any Chicago Bears Courtland Sutton rumors. Okay, that might seem a little vague. Perhaps some context is needed, yes? It started last week when the Bears made the surprising decision to allow Cameron Meredith to sign with the New Orleans Saints. Their refusal to match his restricted free agent offer sheet came under heavy scrutiny. Meredith, presuming the eventual good health of his injured knee, would’ve made a perfect reserve option alongside new additions Allen Robinson and Taylor Gabriel. 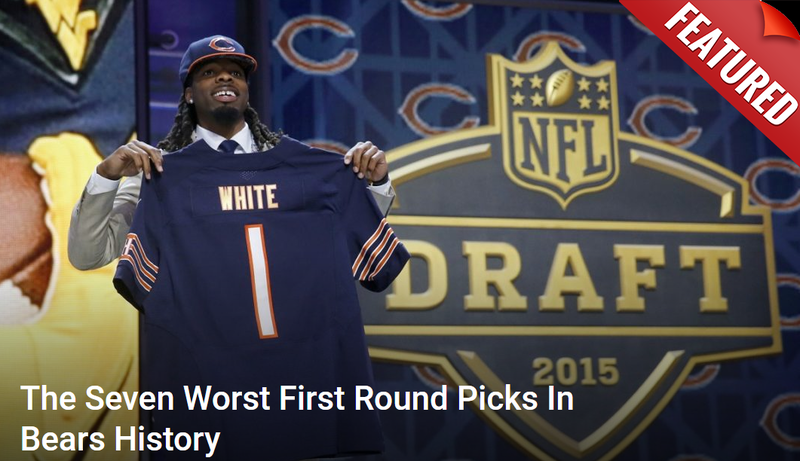 With him gone, the Bears currently have Kevin White or Josh Bellamy slotted for that job. That’s not something that will enthrall the fanbase going into 2018. It’s for this reason expectations were significantly raised going into the NFL draft. Wide receiver didn’t look like a glaring need before. Now it does. Interest in the top names this year has drastically increased. So who could they be honing in on? Based on the sheer volume of meetings, one name has emerged above all others. Courtland Sutton is a bit of a mystery in the draft community. That’s no surprise since he comes out of SMU, a school that isn’t typically a hotbed for top NFL talent. However, it does have a history of producing quality receivers. Their most recent success story is two-time Pro Bowler Emmanuel Sanders. So teams became interested when Sutton began to emerge over the past couple years. One of them appears to be the Bears. According to Aaron Leming of Bear Report, the team has met with Sutton twice already leading up to the draft. The first came during a 15-minute session at the scouting combine and then again during a private workout. This alone would indicate their interest in him goes deeper than typical intrigue. Yet it doesn’t stop there. New reports have surfaced that the Bears were well-represented down at the SMU pro day where they took to working out Sutton again alongside his teammate, Trey Quinn. Former #SMU WRs Trey Quinn and Courtland Sutton currently being worked out by the Chicago #Bears on SMU’s practice field. So why are the Bears so infatuated with him? Sutton is not one people might think would be a target for this new Bears offense. Head coach Matt Nagy seems to have placed a heavy emphasis on more speed and precise route running. Sutton, at this point at least, does not possess either of those things in abundance. His game is about size (6’3″), strength, good hands and body control. He would be viewed as a strong red zone target. The 31 touchdowns he scored in three years for SMU proves that. Yet there may be another reason the Bears have become enamored with him. An NFC scout explained to NFL.com. Current projections say he’s likely to go either late in the first round or early in the second. Chicago holds the #39 pick in that range. If Sutton falls to that spot, it might be a good idea to keep his name in mind when the Bears go on the clock.